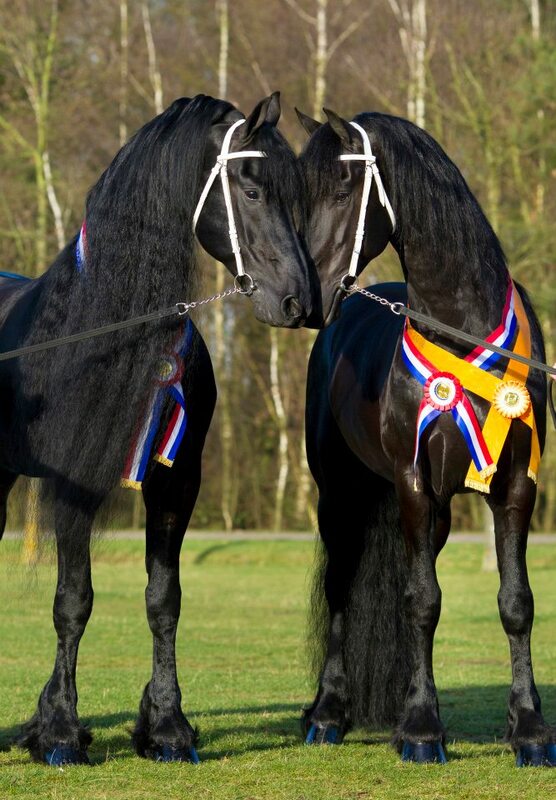 Approved stallions, also known as Studbook (Stb) stallions, are Friesian stallions of exceptional breeding and quality that have passed the strict selection criteria of the KFPS which includes veterinary examinations, gradings and performance tests. Approved stallions are officially approved for breeding and entered into the main KFPS Studbook. Once they have been approved, stallions are given a new name by the KFPS and a numerical suffix, for example; Beart 411, Norbert 444, Walt 487. Please note, there are currently NO STALLIONS IN THE UK APPROVED FOR BREEDING! Every year, the KFPS holds its most prestigious event, the annual Hengstenkeuring (Stallion Inspection) where approved stallions compete against each other to be crowned Champion. 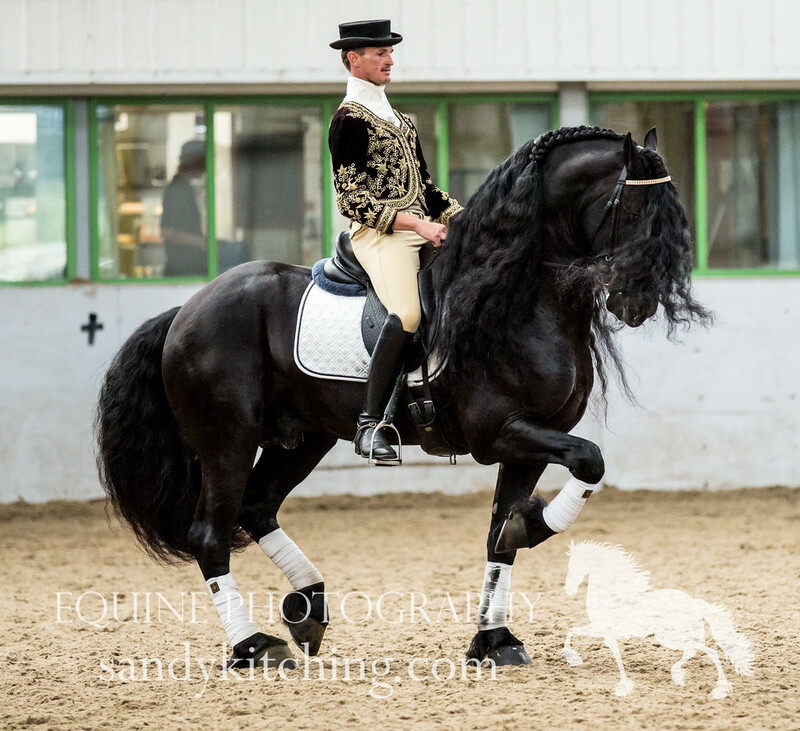 As well as the inspection of approved stallions, this 3-day show combines education and entertainment, including clinics focusing on subjects such as breeding, training, general care, nutrition and welfare of horses and the breath-taking Friesian Proms, where you can enjoy a magical Friesian display to the sounds of a live orchestra. Each year the event draws over 25,000 visitors from at least 30 countries from all over the world, which has earned the Stallion Show the reputation of the largest indoor equestrian event in the Netherlands. On the Thursday, the second viewing of young stallions takes place. The first viewing routinely takes place in Drachten in the first week of December. Following the second viewing on Thursday, stallions that have progressed will compete in the third viewing on the Friday and stallions from this select group will be chosen by the judges to take part in the final phase of the stallion selection procedure, the Performance Test which kicks off in September. This select group of young stallions will be presented to the public on Saturday along with the Jury´s commentary. The Friday programme also hosts a wide range of clinics and after these the day will continue with the third viewing and conclude with the evening´s show programme, the Friesian Proms and election of the Horse of the Year, the Breeder of the Year and the Friesian show driving horses. The Saturday is all about the stars of the KFPS, the KFPS Studbook stallions. There are several classes in which the stallions can compete and make a bid for the highly contested Championship of the AKW Douma Trophy. The afternoon will end with the grand finale when the new Champion stallion will be crowned. Watch the 2017 final and Overall Champion Stallion being crowned.